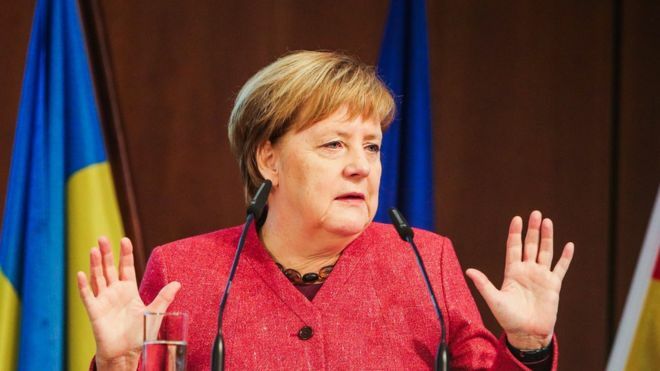 German Chancellor Angela Merkel has stressed there is “no military solution”, after Ukraine’s leader urged Nato to send ships to the Sea of Azov. Petro Poroshenko’s request came following a naval confrontation with Russia in waters off Crimea. On Sunday, Russia opened fire on three Ukrainian ships and seized their crews in the Kerch Strait. Mrs Merkel said the crisis was “entirely the doing of the Russian president”. However, she said that “issues like these can only be solved by sensible dialogue”. Russian President Vladimir Putin accused Mr Poroshenko of creating the naval “provocation” to boost his ratings ahead of 2019 elections. 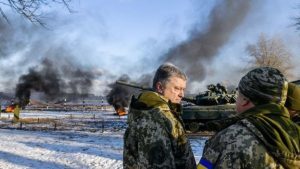 President Poroshenko has implemented martial law across Ukraine’s border regions for 30 days in response to the crisis. Meanwhile, Russian state media report that Moscow has delivered a battalion of S-400 surface-to-air missiles to north Crimea, and also plans to build a new missile early-warning radar station there. The North Atlantic Treaty Organisation is the world’s most powerful regional defence alliance, and members agree that an armed attack against one is considered an attack against them all. Ukraine is not a Nato member, but it is a Nato partner country, meaning they co-operate on some political and security issues. A Nato spokeswoman would not comment directly on Mr Poroshenko’s request, but stressed that “since Russia’s illegal annexation of Crimea in 2014, Nato has substantially increased its presence in the Black Sea”. What did Mrs Merkel say? Speaking alongside Ukrainian Prime Minister Volodymyr Groysman at a business forum in Berlin, Mrs Merkel promised to hold talks with Mr Putin at the forthcoming G20 summit. “I want the Ukrainian soldiers released,” she said. “We must do everything to help places like Mariupol, which depends upon access to the sea. “We can’t allow this city to just be cut off, thus indirectly isolating further parts of Ukraine.